Arm Training Like A Beast! Muscle-Specific Hypertrophy Workouts! Be a beast and use this specialized arm hypertrophy workout. Build huge guns and learn a little anatomy while you are at it. Get ripped now! Workout includes bench, curls, skull crushers and more. The biceps are the muscle most commonly requested to be flexed. Though the triceps are equally impressed, these posterior muscles do not get the same attention. Despite the triceps often being "ignored," working both the anterior and posterior muscles of the upper arm is a must. As its name implies, the biceps brachii is the two-headed muscle, long and short heads, of the upper arm. The long head of the biceps brachii originates from the supraglenoid tubercle of the scapula. The short head originates from the coracoid process of the scapula. The two heads unite to form one tendon, which inserts on the radial tuberosity. The biceps have two functions: flexion at the elbow and supination of the proximal radial-ulnar joint. The reason the biceps also supinates the arm is due to the radial tuberosity is on the ulnar side of the radius. The long head of the biceps can also assist in abduction of the arm if the deltoid is paralyzed. A well-developed brachialis is not often seen in those who do not specifically target the muscle. The brachialis, which is deep to the biceps brachii, originates at the distal anterior humerus and inserts on the ulnar tuberosity. The brachialis is an elbow flexor; it does not participate in supination or pronation of the radial-ulnar joint. When the palms are supinator, both the biceps brachii and brachialis are strong flexors. When the forearm is pronated, the effectiveness of the biceps brachii is reduced, as it tries to supinate while it flexes, while the brachialis still functions fully. The triceps brachii is the three-headed muscle of the upper arm. This muscle group consists of a long, lateral, and medial head. The lateral head originates from the infraglenoid tubercle of the scapula; the lateral head originates from the posteriolateral humerus; the medial head originates from the distal posteromedial humerus. All three heads combine and insert on the olecranon process (elbow) of the ulna. The primary function of the triceps brachii is extension of the elbow. The long head also assists in extension at the glenohumeral joint. *Partials - perform the targeted 8-10 reps then perform 5-8 partial reps focusing on contracting the muscle and the end of the concentric portion of the exercise. 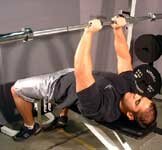 Main Focus: Increasing the weight lifting on barbell curls and close grip bench press. The barbell curl is perhaps the most productive biceps exercise due to the fact one can curl a much greater load during barbell curls than other exercises. People have differing philosophies with regards to barbell curl form. Some say you have to do every rep as strict as possible while others advocate using some momentum or "cheating" during the exercise in order to use a greater load. 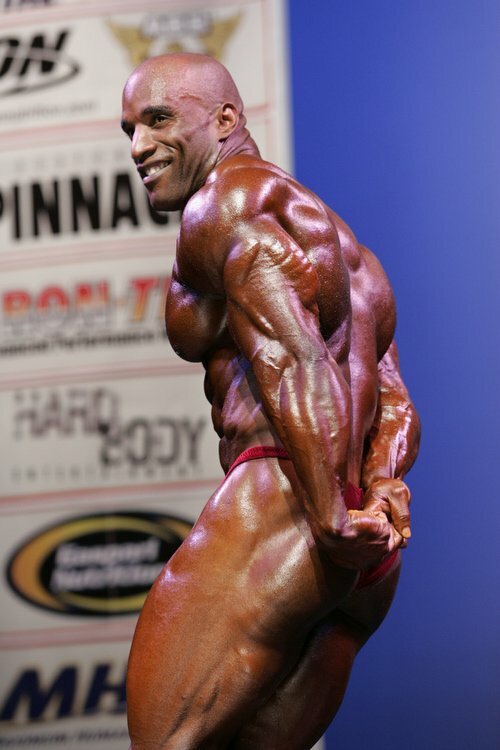 My belief is that one should use strict form and control the weight during every rep. Now a little "cheating" on the last rep or two is not a bad thing so long as you are still doing these reps in a controlled fashion and not straining your back. Grip width should be shoulder width. Elbows should be locked at your sides as you flex your elbow and contract your biceps. Try not to flex at the shoulder joint because this will move your elbows forward and take some tension off your biceps and placing it on your delts. Like barbell curls for biceps, close grip bench press always you to lift a greater load with your triceps compared to other exercises. 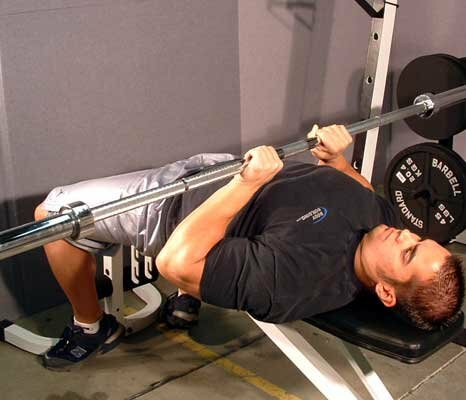 When done correctly, you should be able to place the greatest tension on your triceps and not on your pecs or delts, though they will still get stimulated some as this is a compound movement. Grip width should be shoulder width or slightly narrower with a neutral grip. 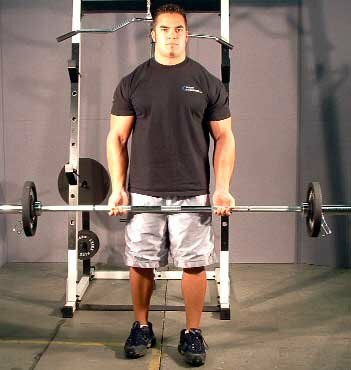 With your eblows close to your sides, not flared out, flex your elbows and lower the bar until your arms are parallel to the floor, this will keep the tension on the triceps. Powerfully push the bar up by extending your elbows and contracting your triceps. Increase blood flow to the muscles, creating a more intense pump. Provide a more metabolic than mechanical stimuli. 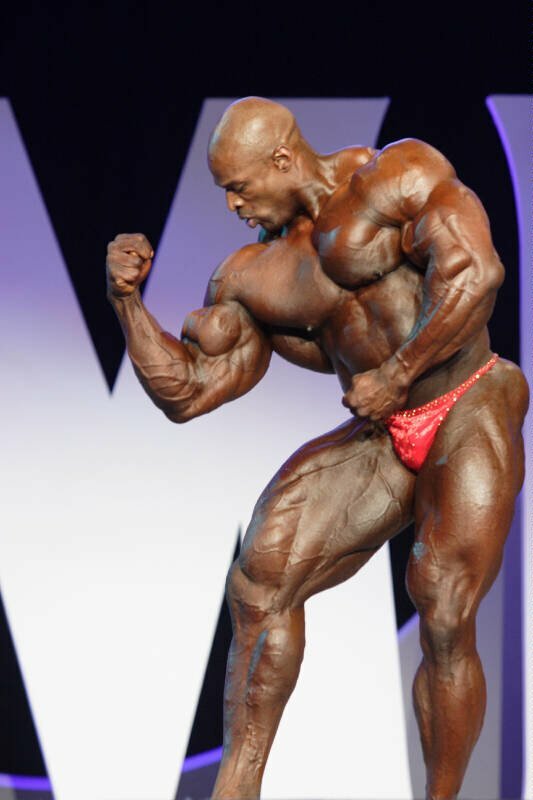 Adding partials at the end of each set intensifies the metabolic stimuli of each set. These exercises should be done using very strict form. Note: There is no rest between the exercises in the supersets. Workout B is setup to hit the muscles of the upper arm from all angles. 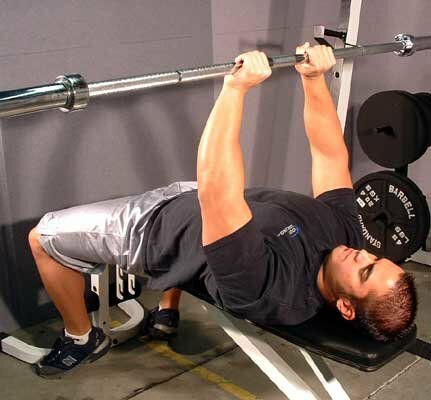 Now some people might say it is not necessary to do so and to just stick to the main compound lifts (barbell curls, close grip bench press, skull crusher) and be done with it, but this is a specialized routine for someone who has tried that and still cannot get their arms to grow. Remember, the biceps are made up of two muscles, the triceps is made up of three muscles, and the brachialis needs to be stimulated as well. Changing up the grip you use on these exercises will hit all of the muscles of the upper arm, allowing for greater growth. What Is Your Favorite Part Of The Arm? Explanation on each exercise is not needed. Simply change your grip for the #1 exercises, perform the #2 exercises with no rest between sets, and then hit the #3 exercises hard at the end. There has never been so much great information about developing your arms! This comprehensive listing will feature arm workouts, a breakdown of the arm, top arm muscle builders, and much more.